President Donald Trump and Democratic lawmakers are headed for a showdown over whether the trade deal he signed with the leaders of Mexico and Canada on Friday does enough to protect American workers. Democrats, who will control the House of Representatives starting in January, could hold up the deal and make the Trump administration renegotiate it. In an attempt to force their hand, Trump pledged this weekend to pull the U.S. out of the North American Free Trade Agreement, giving Congress an ultimatum between the new deal, known as the U.S. Mexico Canada Agreement (USMCA), or no deal at all. Both Trump and the Democrats have railed against NAFTA for years as a bad deal for American workers. “Nobody wants” the no-deal option, said Bill Reinsch, a trade policy scholar at the Center for Strategic and International Studies. Both Trump and the Democrats have railed against NAFTA for years as a bad deal for American workers. The disagreement comes over exactly how the USMCA aims to remedy those concerns. “This will help stop auto jobs from going overseas and will bring back auto jobs that have already left,” Trump added. The new deal does provide more protections for U.S. workers than NAFTA, but the effect it will have on auto workers is far from certain. Economists and labor law experts say much of what happens next depends on whether Mexico’s new President Andrés Manuel López Obrador will push through labor reforms, as well as make broader efforts to boost Mexico’s economic productivity. They say the changes could boost Mexican wages and put American and Mexican workers on a slightly more equal playing field, which in turn could also allow Mexico to buy more U.S. goods — another benefit for the U.S. economy. The disparity in wages between Mexico and the U.S., where where auto workers on average make about $20 per hour, likely won’t change anytime soon. But if Mexican workers were to earn more than they do now, U.S. companies would have less incentive to move factories across the border. 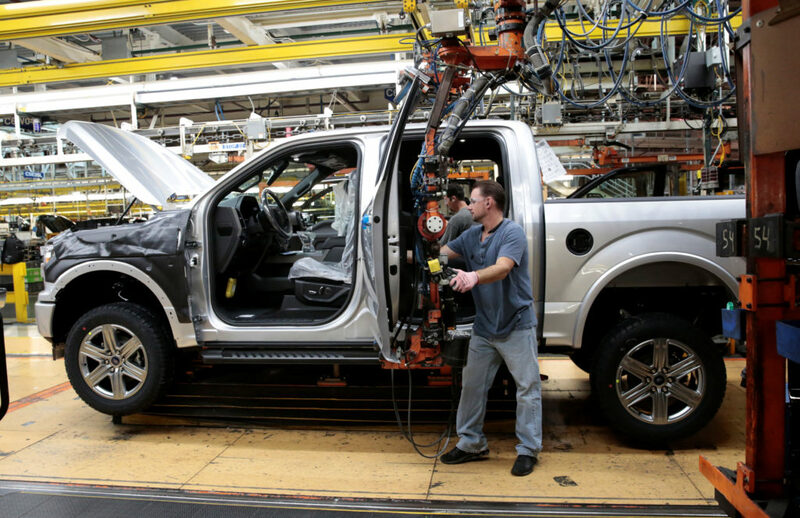 The USMCA trade deal includes a provision that requires automakers to produce 40 percent of a car’s parts by 2030 in factories that pay an average of $16 per hour, or risk not qualifying for free-trade status. It’s a move the Trump administration says will bring more jobs back to the U.S.
Mexican workers in the auto industry earn on average $8 per hour, but some are paid about $2 per hour. It’s unlikely that employers would double wages to meet the new USMCA requirements, but they don’t necessarily need to. Many of the cars produced in Mexico already meet the threshold outlined in the USMCA. Many auto parts are also made in the U.S., where workers are paid higher wages. The parts are then shipped to Mexico, where cars are assembled by Mexican workers earning substantially lower wages. Research and development labor, which includes higher-paid positions such as engineers, can also be counted toward the 40 percent total. That means car companies could meet the requirements under the deal by having a few high-wage workers in the U.S. to design and create certain auto parts and a larger number of low-wage factory workers in Mexico. Companies that do not meet the threshold but think it is too costly to shift operations to the U.S. could also simply decide to pay the 2.5 percent tariff for violating that part of the agreement. As Mexican wages have remained stubbornly low in recent decades, the productivity gap between the American and Mexican economies is also widening. A significant portion of Mexicans work in informal jobs, which require low-tech skills and tend to have few resources devoted to boosting production. That is something no international deal can fix, said Robert Lawrence, a professor of international trade and investment at Harvard University. 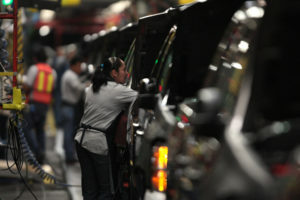 Other economists say real wages have not kept pace with the increase in productivity in Mexico’s manufacturing sector. Labor unions say that’s because a lack of workers’ rights drives wages below market value. The AFL-CIO, the largest federation of unions in the U.S., has said workers who try to form or join a union in Mexico are routinely fired and even if they are not, the process to form a union can take years. Earlier this year, the AFL-CIO accused Mexico of suppressing wages and busting unions, claiming that unions in that country are largely formed through a back-deal process aimed at protecting the company, not the employee. The lack of credible, imposed consequences for using those kinds of shady labor practices provides an incentive for Mexico to drive wages lower as a means of attracting foreign investors, said Harley Shaiken, a University of California, Berkeley professor who focuses on labor and the global economy. That is where labor advocates are hoping other provisions in the USCMA will make a difference. The USCMA requires that companies abide by international labor standards, which include the right to collective bargaining. As a part of the deal, Mexico would commit to adopting legislation that would give workers the right to form a union, and create an independent body to resolve labor disputes. The question is whether those rules will be enforced. Under NAFTA, violations were rarely punished. If a complaint was made, it would often take years to go through a lengthy arbitration process. The new deal clarifies what constitutes a labor violation, closing a loophole that labor groups say let countries, which were breaking the terms of past agreements, off easy. An arbitration process that allows investors to sue a country has also been changed substantially. One of the major differences is that foreign investors must first try to settle the case in domestic courts before going to the international level. But the USMCA largely uses the same arbitration mechanism as NAFTA when it comes to disputes between two nations, which labor groups fear will again make enforcement difficult. “There aren’t enough teeth” in the deal, said Celeste Drake, a trade and globalization policy specialist for the AFL-CIO. Both Sen. Elizabeth Warren, D-Mass., and Sen. Bernie Sanders, I-Vt., echoed that sentiment last week. “Unless strong enforcement mechanisms are written into the text of this agreement, corporations will continue to ship U.S. jobs to Mexico,” Sanders said in a statement. “It’s NAFTA 2.0,” Warren said in a speech Thursday. Still, if the labor reforms are enacted, they could have a significant effect on Mexican wages. “In the long run, that could have more impact than just the straight playing with a number like $16 an hour, which affects a small number of workers,” said Lance Compa, an international labor rights lecturer at Cornell University. Mexico’s newly elected legislature already passed a law earlier this year that specifically bans anti-union discrimination. 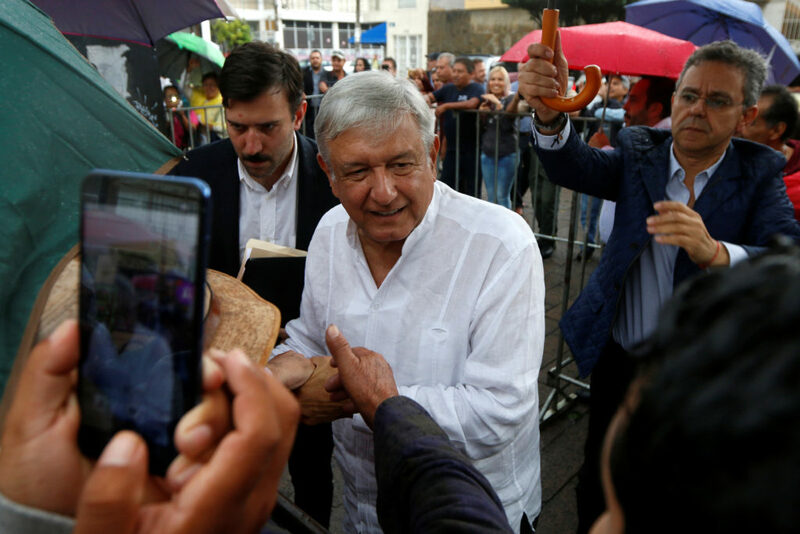 Additional reforms are expected to be implemented after López Obrador, a left-wing politician who campaigned on cracking down on corruption, takes office. The deal “coincides with a changing government that wants to implement, on its own accord, this reform,” said Alvaro Santos, a Georgetown University law professor who is working as the deputy chief negotiator for the Mexican government. There are legal mechanisms to ensure those reforms take place. The trade agreement includes a provision that could delay its implementation if the Mexican Congress does not pass the promised laws, although it is unclear whether the U.S. or Canada would enforce that provision. The Mexican government will also likely face steep opposition to the reforms. In 2012, the first overhaul of Mexican labor laws since the 1970s was largely seen pro-business. Investors welcomed the changes, but leftist groups decried them as anti-union. The changes did not boost the Mexican economy immediately, but there are signs that the reform is, six years later, encouraging more people to enter the formal labor force. Unions now say the reforms, which were buttressed by subsequent laws, could actually help workers if they were enforced. This time, if the new government implements more changes and enforces new laws, it could give workers more bargaining power.